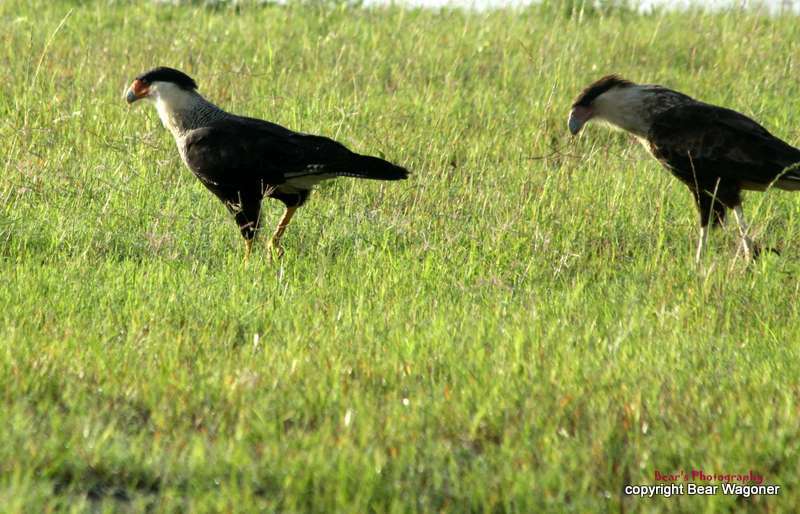 The Northern Crested Caracara is usually seen alone or in small family groups, however when feeding on a carcass or at roost, they may congregate in bigger groups. Sometimes, 20 to 80 birds can be seen at a time! Though the Golden Eagle is Mexico's national bird, some believe it is the Crested Caracara depicted on the ancient Aztec pictogram that appears on Mexico's flag. 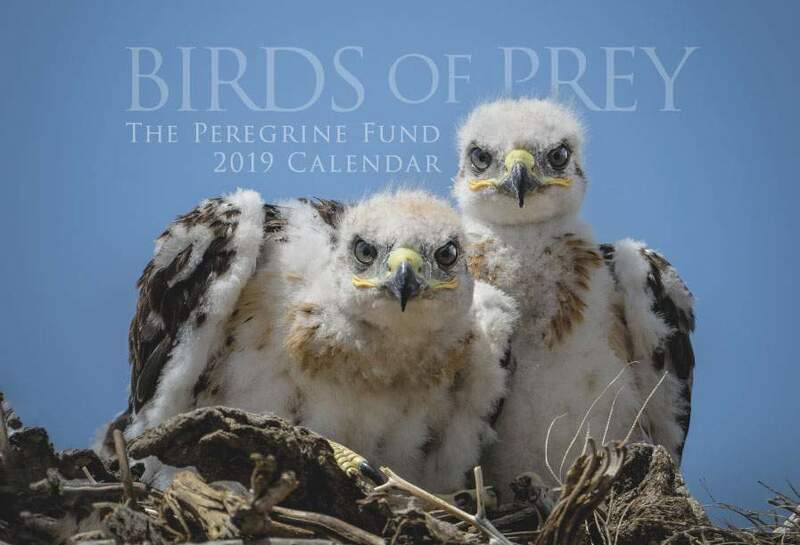 The Peregrine Fund doesn't work directly with Northern Crested Caracaras, but our efforts in scientific research, habitat conservation, education, and community development help conserve birds of prey around the world. We also supply literature to researchers from our avian research library, which helps scientists around the world gather and share important information on raptor conservation. Unlike the Peregrine Falcon, which can be found throughout much of the world, the Northern Crested Caracara is restricted to the Americas. You won't find it in Canada or Alaska or even the northern United States, however. This caracara's northernmost range is the southern United States. It can be found in southern Arizona, central and southern Texas, southwestern Louisiana, and central and southern Florida. 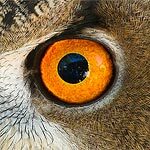 Though this species has been documented passing through other states, including New Mexico, Mississippi and Oregon, these are rare occurrences, and some of these sightings might have been of birds that had escaped from captivity. Outside of the United States, the Northern Crested Caracara's range continues south into parts of Mexico, Central America and the Caribbean, including Cuba and Aruba, and into parts of South America, including Peru and northern Brazil. Similar to the Aplomado Falcon, the Northern Crested Caracara is a bird of open country. It avoids dense forests and thickets and high elevations, preferring lowland to middle elevation habitats. These lovely birds can often be seen hunting or scavenging in man-made habitats like cattle ranches, farmland, and pastures, but they also inhabit prairies, scrubland, savannas, deserts, and beaches. The Northern Crested Caracara has unique and striking plumage. One of its most distinctive features is the black patch of feathers on the top of its head. Unlike the long, elegant crest of the Harpy Eagle, however, the caracara's crest is dense and when raised looks short and shaggy – almost as if it were having a bad hair day! The adults have beautiful cream-colored necks, mottled breasts and dark wings and backs with distinctive white patches on their wings and tail. They also are equipped with relatively long legs, which are yellow. Similar to the Bateleur, the caracara has a featherless patch of skin on its face that ranges in color from pale yellow to red, depending on whether the bird is relaxed or stressed. Though not bald like most vultures, the bare skin on its face serves the same purpose as a featherless head. 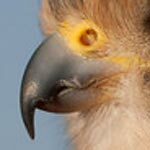 Because caracaras also feed on carrion much of the time, having bare skin above the beak helps to keep them clean. After all, no one wants to walk around with bits of food stuck to their face. 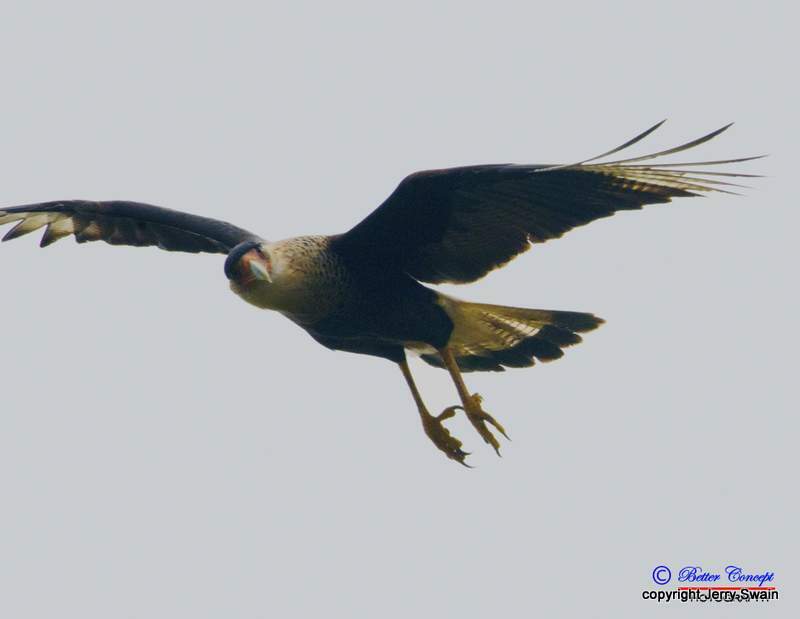 Unlike most other falcons, such as the Orange-breasted Falcon, Northern Crested Caracaras are not known for their swift, dynamic, acrobatic flights. Instead, they tend to spend a lot of time on the ground or perched on fenceposts and small trees. Northern Crested Caracaras are most often seen alone or in pairs. During breeding season, they can be seen in small family groups while their young learn to hunt and gain independence. Though the population in the United States is still relatively stable, the Northern Crested Caracara is considered threatened in Florida. 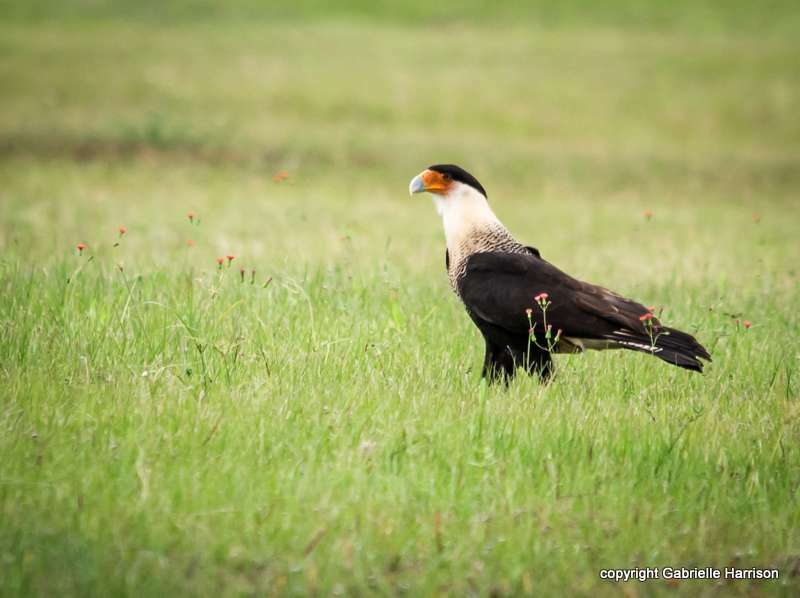 Loss of habitat, particularly due to development and the expansion of citrus orchards, is negatively affecting caracara populations in this state. 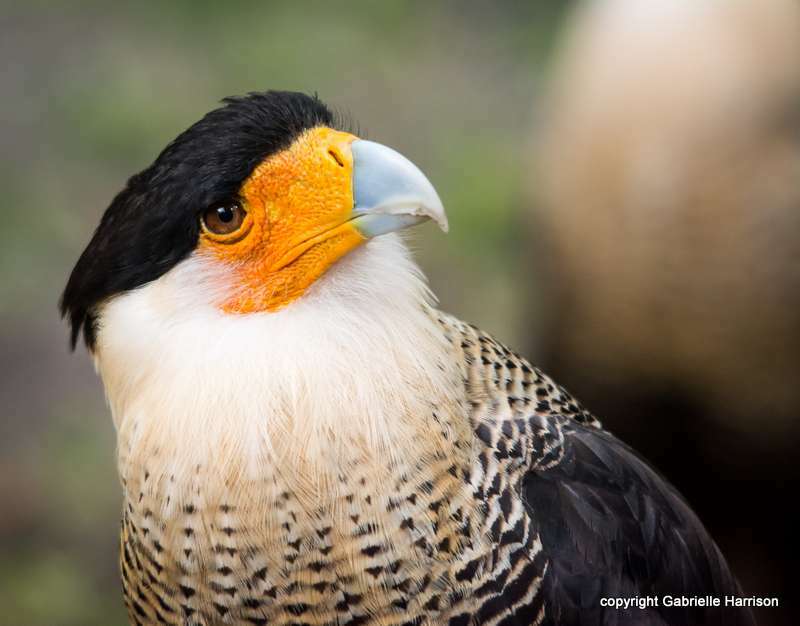 While caracaras are moving into deforested areas throughout their range, they still face many threats. Human persecution, loss of habitat, collisions with cars, poisoning and other factors may threaten the species in the future. 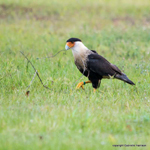 Along with the Secretary Bird, the Northern Crested Caracara is one of the few other raptors that hunts on foot. This species walks on the ground, often along roads, searching for food. The caracara is not a picky eater and has an extensive menu, which pretty much includes anything it can catch. They eat small mammals, amphibians, reptiles, turtles, fish, crab, eggs, insects, worms, and nestling birds. 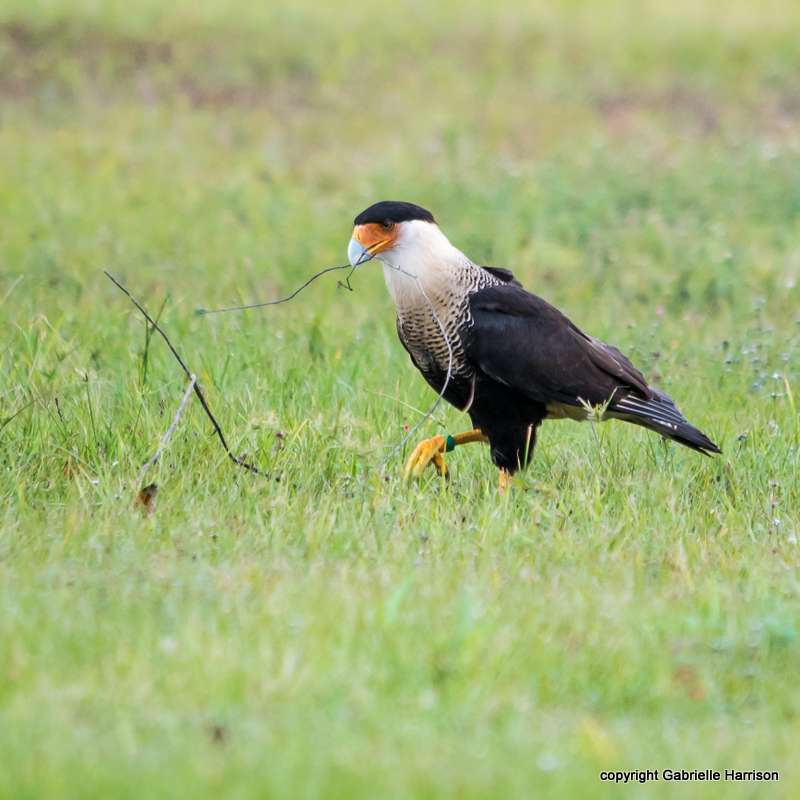 In addition to their hunting skills, caracaras are big carrion feeders. Because they fly much lower to the ground than vultures, they often are the first on the scene of a feeding frenzy. These birds can be aggressive when it comes to their food and often dominate over the much larger vultures that come to feed on the same carcass. Like many birds of prey, where they live and time of year help determine what they eat. For example, in Florida, scientists have found that breeding caracaras feed larger vertebrate prey to their nestlings. However, non-breeding birds actually eat a greater number of invertebrates. But caracaras don't stop at feeding on carrion and hunting on foot. They have developed a few other interesting hunting techniques. 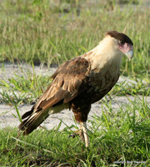 Like Aplomado Falcons, Crested Caracaras often pirate food from other species. 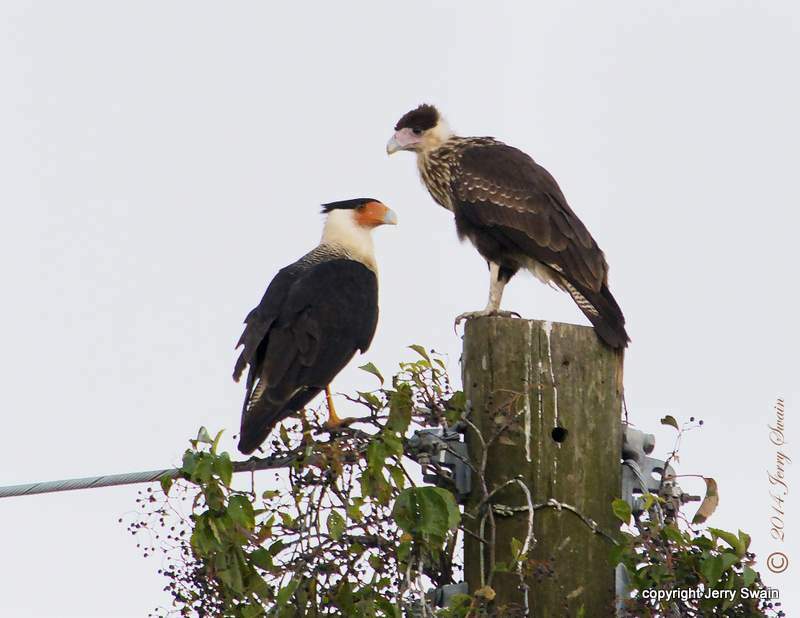 If a caracara spots another bird carrying food, the caracaras wil fly after, dive bomb and otherwise harass the other bird until it drops its prey. As another means of finding food, this species also will show up at grass fires and fields that are being plowed to prey on animals, such as lizards, rodents and insects, that normally find good hiding places in grass or thick shrubs. This gives a whole new meaning to the saying, "out of the frying pan and into the fire!" 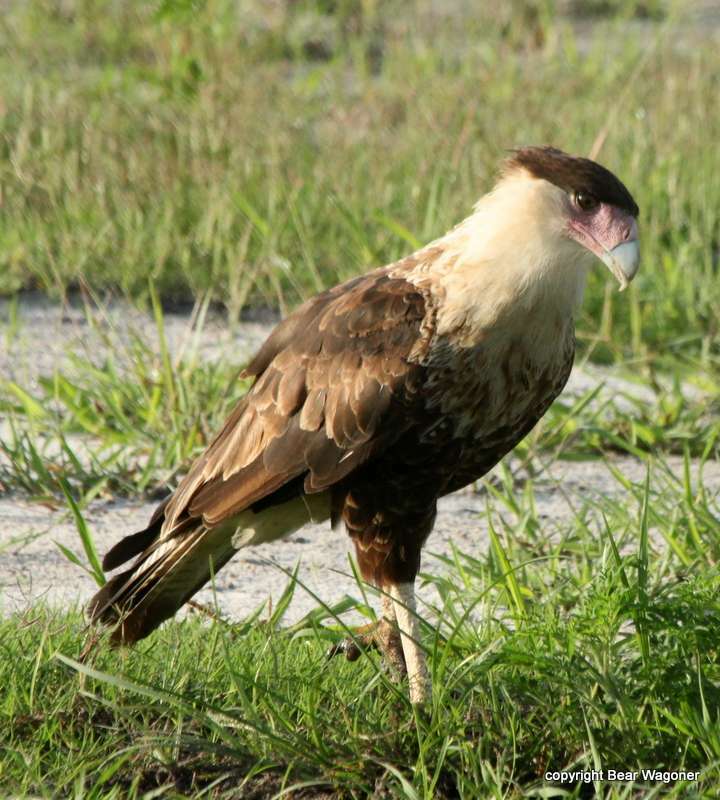 The Crested Caracara differs from most other birds in the falcon family. Take its nesting habits, for example. Most other falcons do not build their own nests, laying their eggs instead in abandoned nests built by other birds, on cliff ledges or in crevices in cliffs or trees, and sometimes even on the ground. 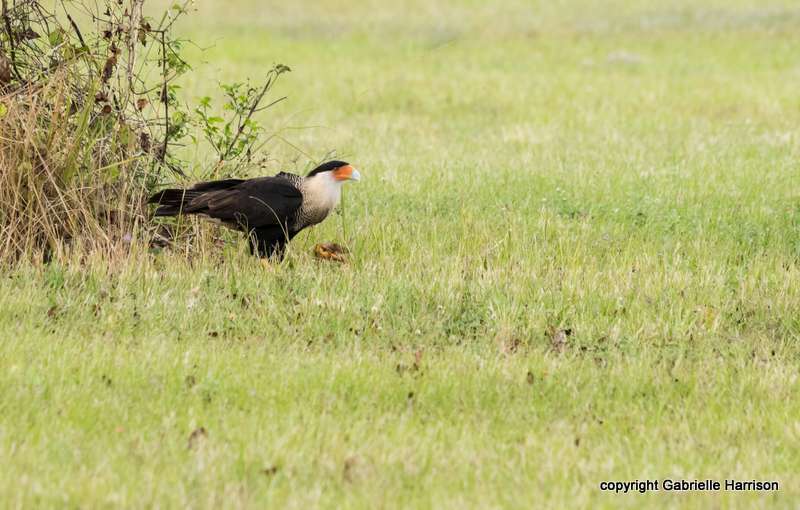 The Northern Crested Caracara, on the other hand, does indeed build its own nest. It is made of sticks, grass and other plant material and tends to be a large and bulky cup-shaped structure. 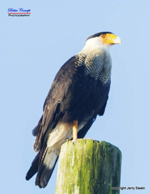 Caracaras usually place their nests in palms, on tops of cactus, or in trees in otherwise open savannas. After the nest is built, the female lays 2-3 whitish brown eggs. Both parents participate in incubation duties for about one month. When the chicks hatch, they are covered in off-white down on most of their bodies, except for their distinctive black patch. Though the feathers are downy at first, the black patch is evident right away. After about 3 months of being cared for by their parents, the young fledge, or fly for the first time. The caracara family usually stays together another 3 months while the young learn to hunt, avoid predators and otherwise survive on their own. After this time, the young disperse and begin to search for territories and mates of their own. The World Center for Birds of Prey offers fun ways to learn about birds of prey. The visitor center offers interactive displays, tours, interesting videos and a children's room with activities from coloring sheets to quizzes to costumes and a touch table for the curious mind. We also have several different birds of prey on display year-around. Knowledgeable staff and volunteers are on hand to answer any questions you may have about Crested Caracaras or any other birds of prey.